How Can God be Good and All-Powerful When There is So Much Evil and Suffering? Perhaps one of the most common AND most difficult objections to the Christian faith is the problem of evil. Bad things happen in this life. Painful things happen in this life. And they often cause us to ask where God is or why he would allow such things. A pet that you loved dies. A girlfriend or boyfriend breaks up with you unexpectedly. The sport you love to play is suddenly taken away by a bad injury. You get abused by someone you love. You come home one day to find that your Dad has walked out. Your parents sit you down to tell you that your mom has cancer. A close friend commits suicide. These are only some examples… not to mention large scale things like hurricanes, famines, genocides, and war. How in the world can we believe God is all-powerful and a good Father in the midst of all of this? Because if he is really a good father, then he would want to get rid of all this evil, right? And if he is an all-powerful God, then he would be able to get rid of all this evil, right? Take your pick… it’s a this or that. Either he can be all-powerful OR he can be good, but he can’t be both. He can’t be the God of the Bible, right? This is not simply an intellectual question… it’s a personal one. This is a problem WE ALL have to deal with when things go wrong in our life or we witness horrible suffering in the world. This is by no means a new problem. It’s a problem that people have faced since the dawn of the world. Big Idea: God doesn’t work how we expect him to. Notice the sisters don’t invite or ask Jesus to come. It assumed that as soon as he hears his friends are suffering he will be on his way. To think otherwise is inconceivable. Which is what makes Jesus’ response so shocking… He stayed where he was for two days. Why??? Because he loves the sisters and Lazarus… that makes no sense to us. God doesn’t work how we expect him to. Don’t you care? Were you unable to come? Why weren’t you here? There are many things this passage as a whole teaches us about evil and suffering… I want to draw out several of them. Christianity allows us to see evil for what it is. Our pain is not pointless. God got his hands dirty with evil. Evil and suffering have a deadline. Attention Funnel: What Decade Did that Take Place?? The final way that God is different than us that we are going to look at is that God is eternal. God is not bound by time. He has no beginning and end. This is obviously different then us. We are dominated by time. We have 24 hours, 7 days, 12 months, and perhaps 70-90 years. That’s it. It is impossible to escape time. One year, I decided I was going to try to do it. My goal was to never look at a clock for the entire year. I would just set alarms on my phone telling me when the next thing was there for me to do. I quickly realized how foolish this was, not only because I would have to look at a clock to set my alarms, but also because I would spend so much time trying not to look at what time it was that I would end up wasting a lot of my time. One of the most well-known passages on time is found in Ecclesiastes chapter 3. It’s a passage quoted at funerals, in well-known songs, and by famous movie characters. And it’s a passage that teaches us to learn to live not only under the rule of time, but under the rule of the one who controls all time. Big Idea: The timeless God orders all of our times. Our lives are full of good and bad times. Because God is outside time, He orders all our times. We can live as ones who know the ending. We can know the ending because the incomparable God became one of us. In the first lesson the title was Where is God? and tonight we finish off the series by seeing that God is in the details. Big Idea: God Orders All the Details of our Lives. God’s providence should us to be content and patient. No detail is insignificant in God’s hands. Two things that often seem to be opposite are God’s sovereignty and our action. God’s sovereignty means that he is in control of everything that happens. He has directed history to the exact place that we are ate right now. Nothing has happened that he did not plan and purpose to happen. Currently he is directing every detail according to his will, nothing happens that is outside of his control. And he knows all that will happen in the future because he has planned for it to happen already and he has the power to make it happen. Verses: Ephesians 1:11; Proverbs 19:21; Isaiah 44:7; 64:8. Like going to a restaurant where they give you a menu and there’s only one choice – “Do you want the roast beef or the roast beef?” You don’t have any choice. This is how we can often paint God’s sovereignty and our action… it’s one or the other, but they can’t go together. Big Idea: Faith in God’s sovereignty leads to action. Set the Stage for where we are. Persia – Most powerful empire in the World. Xerxes – The current King who is self-centered and over-indulgent. Esther – Has risen to become queen through an immoral situation. Mordecai – Esther’s cousin and adoptive father who is also in a position of power. Haman – The second most powerful man in the Empire – Mordecai disrespects and refuses to show him honor and Haman responds by coming up with a plan to kill all the Jews in Persia. Theology is more than just head knowledge. You are where you are because God wants you there. Faith translates to risky obedience. Jesus took the ultimate step of risky obedience for us. Last week we talked about the fact that God never abandons his people. We looked at how in Esther chapter 1 and 3 powerful people and random chance seems to be what control the circumstances we face. But as we looked behind the surface we saw God’s hand at work directing things according to his plan. We also talked about how God can often seem distant or even absent (remember God is never mentioned in the book of Esther). And we talked about how life will not go how we planned or expected it too… there will be things that we face that we really don’t want to, but in the midst of these we hang onto the faith that God is good, wise, and powerful, despite what our circumstances may want us to believe. The Cross is the ultimate exclamation point of God’s faithfulness… it’s where we need to fix our eyes especially when life is not going how we want it too. Tonight, I want us to look at chapter 2. It’s here that we see Esther’s rise to power. Her rise to power is marked by compromise and sin. Attention Funnel: People More Famous their Mistakes then their successes. We all don’t want to be known or remembered for our mistakes. We have many things in our lives that we regret, that we wish we could just forget, and that we hope no one remembers us for. I want to show tonight how God takes imperfect people and the messes they’ve made and redeems them for his purposes. Big Idea: God uses imperfect people for his perfect purposes. Esther is far from perfect. God uses Esther for his purposes. Redemption is all about God saving and using broken people. 2) We can control what’s in a box fairly easily. We cannot control fire very easily. Scripture – Out of the Box and Into the Fire is a series in which we are going to look at the first four chapters of Exodus, specifically the events surrounding the burning bush. We have historically named this story, “Moses and the Burning Bush.” This describes the event well, but it doesn’t really tell us what story is about. The story is not primarily about Moses or the bush, rather, it is about God calling Moses to save the Israelites AND revealing himself in some amazing ways. Control: We are not able to control God. We cannot fit him neatly in a box of propositions and say that we know him. A god who is wrapped up in a box is an idol, not God. 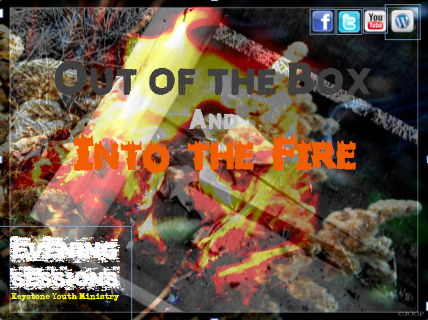 Mystery – Out of the Box and Into the Fire is a series that is meant to look at how God is bigger then we can comprehend or imagine. We can know him through the Bible and what it tells us about him, but we can never fully know him, or even fully comprehend all that he tells us about himself through the Bible. E. In some ways it is like looking into a night sky. We can comprehend something of the universe we live in. We can see stars, a moon, and massive blackness. We understand that the universe is much bigger than we can fully understand. Yet we love to look into the sky and imagine where it ends. Even if we a cosmologist and study the universe in great detail, there will still be a limit to our understanding. Big Idea: God rules over all that happens in this world…even if we can’t see it.